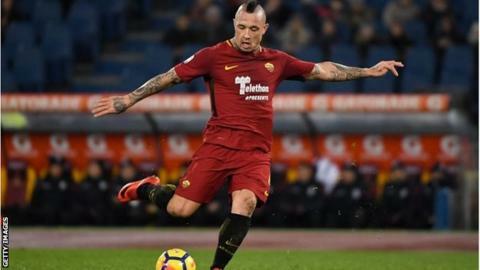 Roma have dropped midfielder Radja Nainggolan for Saturday's Serie A game against Atalanta as punishment for his New Year's Eve celebrations. He posted a live video on social media in which he drank, smoked and cursed. "In accordance with the line dictated by the club and agreed by me and Nainggolan, the player won't be called up for the Atalanta match," boss Eusebio di Francesco said. The Belgian, who has apologised, has been linked to Guangzhou Evergrande. Match ends, Roma 1, Atalanta 2. Second Half ends, Roma 1, Atalanta 2. Federico Fazio (Roma) is shown the yellow card. Attempt missed. Bryan Cristante (Atalanta) right footed shot from the centre of the box is too high. Assisted by Remo Freuler with a cross following a corner. Corner, Atalanta. Conceded by Kostas Manolas. Attempt blocked. Stephan El Shaarawy (Roma) right footed shot from outside the box is blocked. Assisted by Maxime Gonalons. Corner, Roma. Conceded by Andrea Masiello. Attempt blocked. Stephan El Shaarawy (Roma) right footed shot from the centre of the box is blocked. Attempt blocked. Stephan El Shaarawy (Roma) header from the centre of the box is blocked. Assisted by Bruno Peres with a cross. Foul by Stephan El Shaarawy (Roma). Stephan El Shaarawy (Roma) wins a free kick on the left wing. Foul by Bryan Cristante (Atalanta). Substitution, Roma. Bruno Peres replaces Alessandro Florenzi. Attempt blocked. Aleksandar Kolarov (Roma) left footed shot from outside the box is blocked. Assisted by Alessandro Florenzi. Corner, Roma. Conceded by Mattia Caldara. Attempt missed. Alessandro Florenzi (Roma) right footed shot from outside the box is close, but misses to the left. Assisted by Kostas Manolas. Stephan El Shaarawy (Roma) wins a free kick in the attacking half. Attempt saved. Diego Perotti (Roma) right footed shot from outside the box is saved in the centre of the goal. Assisted by Maxime Gonalons. Substitution, Roma. Cengiz Ünder replaces Kevin Strootman. Mattia Caldara (Atalanta) wins a free kick in the defensive half. Attempt missed. Edin Dzeko (Roma) header from the centre of the box misses to the right. Assisted by Alessandro Florenzi following a corner. Corner, Roma. Conceded by Hans Hateboer. Substitution, Atalanta. Andrea Masiello replaces Alejandro Gomez. Hand ball by Maxime Gonalons (Roma). Substitution, Atalanta. Andrea Petagna replaces Andreas Cornelius. Attempt missed. Aleksandar Kolarov (Roma) left footed shot from outside the box is close, but misses to the right. Assisted by Patrik Schick. Foul by Alessandro Florenzi (Roma). Corner, Roma. Conceded by Rafael Toloi. Attempt blocked. Stephan El Shaarawy (Roma) right footed shot from outside the box is blocked. Assisted by Patrik Schick. Goal! Roma 1, Atalanta 2. Edin Dzeko (Roma) left footed shot from the centre of the box to the bottom right corner. Assisted by Stephan El Shaarawy with a through ball. Offside, Atalanta. José Luis Palomino tries a through ball, but Andreas Cornelius is caught offside.